Even before I pulled open the curtains this morning I knew I would be greeted with a beautiful view. 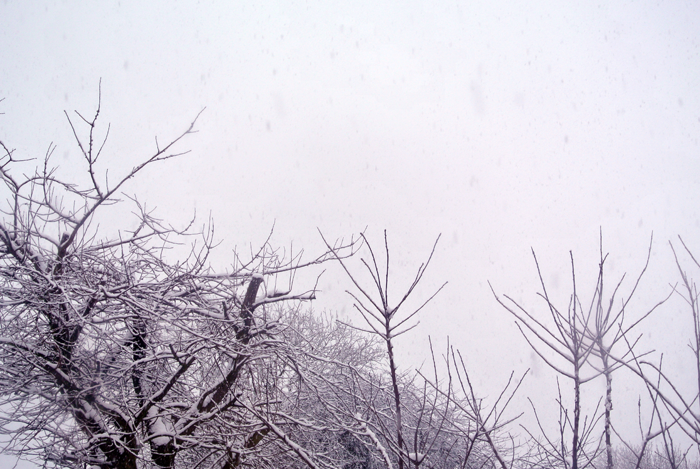 There was a distinct nip in the air that is only there when those beautiful white snowflakes are falling from the sky. The snow clouds were thick and misty and everything in sight was covered with a picture perfect twinkling blanket of snow. I love snow days. I do. But they always bring with them a slight touch of melancholy and pensiveness. I couldn't even begin to explain why, because truthfully, I have no idea. Nature is so intrinsically beautiful. Not every part of it is beautiful. Some parts are upsetting, hard to comprehend. But as a whole entity, it is undeniably beautiful. There is beauty in everything, it's not always conventional beauty, but it's certainly there. There are so many things that I don't know. So many things that I will never know. I do know, though, that all my best thinking is done on snow days. It's a pity they don't happen more often because I probably would have accomplished a little more in my life if they did. "Oh err, hey there. Watcha doing? Err, can I help? Can we play with toys now? Can I eat that?" "Oh I'm sorry, what? Oh, I've got something on my nose? Stop laughing. Did I get it? No? How about now? STOP laughing. I'm going to eat your slippers later for laughing. That'll teach you a lesson." I also know that Mister Bailey (our puppy) is so excited, confused, baffled, curious and probably every other emotion too by the snow. He liked running in it until he slipped. He liked eating it until it went up his nose. He liked trying to catch it until he realised he wasn't really getting anywhere. So he opted to bark at it instead. Trying to teach it a lesson. And then it was lunch time and all was right with the world. He always makes me smile. Always. Lovely post & beautiful photos :) I spent today at my desk watching the snow fall through the window and longing for a day like this! Beautiful photos! I love snow And I miss it so much since I moved to live in UK. We tend to get loads snow in Poland. Such beautiful photos! 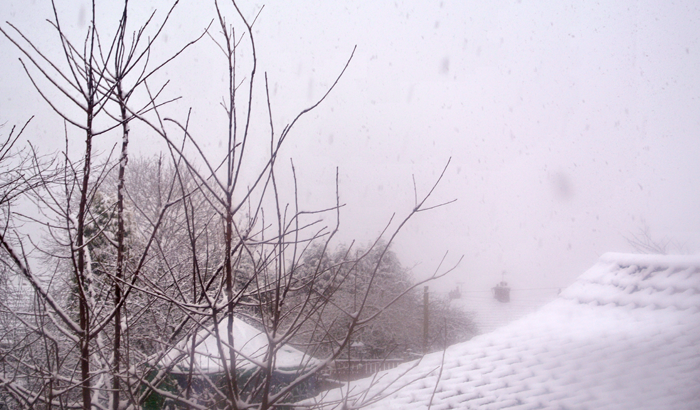 I didn't manage to get any photos of the snow since I was revising, but yours are stunning! Haha I love this post and am so so jealous of the snow! I remember when I lived in London, I woke up to St. John's Wood covered in snow one day. It was so beautiful & one of my best memories of London. The city looked, at that moment, more wonderous than ever. 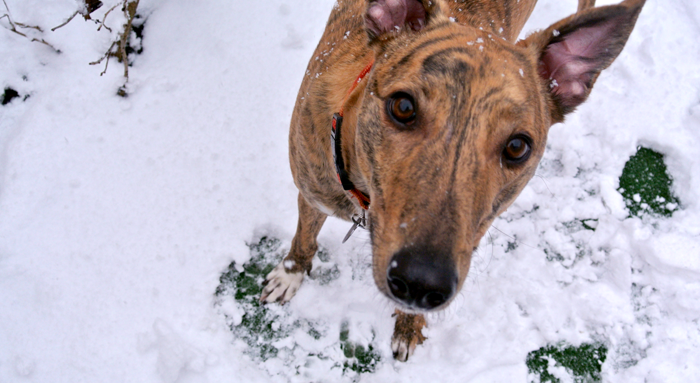 Aww, Bailey in the snow is so cute! We've not had any snow here yet, but we're predicted some for the weekend. I'm so excited! Hi it seem to be snow everywhere in the UK except where i am!! Not a single drop of snow, i live in south London. This annoyed me as i want snow. Wow it's so magical looking there right now! 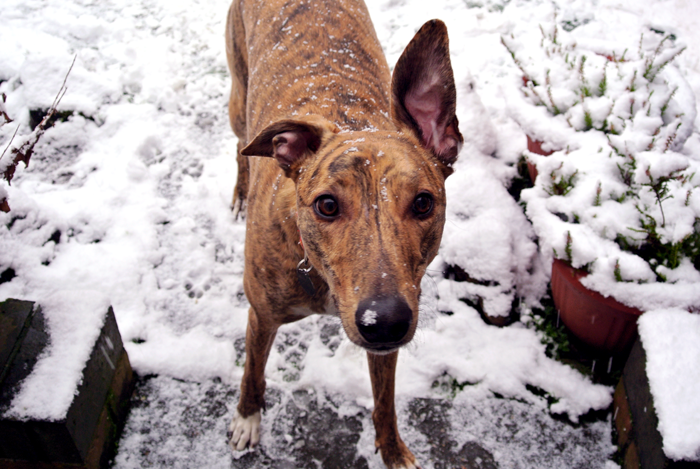 We have snow atm too, but it's icy and disgusting and I am not liking it!! Snow really does make everything beautiful!! I always used to hate snow because I hated being cold and wet more than anything. But one night I was going through a bad time and was stuck at a train station, middle of the night, all on my own crying my heart out and it started snowing. I had no coat, no shelter- just stared up into the falling flakes and it was the weirdest feeling. It was like I became aware of dimensions for the first time in my life and I realised just how beautiful snow, and life, really is. It's hard to explain but it was incredible. I still hate the cold and the wet but I can appreciate the beauty of snow now, and it also fills me with contentment, happiness and a feeling of melancholy. It looks so pretty :) I love snow days!